A new report in PNAS, Probing synaptic vesicle fusion by altering mechanical properties of the neuronal surface membrane, from Chuck Stevens’s lab, raises a serious concern about using styryl dyes to study release probability of synapses. Styryl dyes, such as FM 1-43, partition into cell membranes and have been commonly used to measure synaptic release of vesicles in culture and brain slice. The protocol is simple, bathe the neurons in dye, electrically stimulate to cause massive synaptic release and then dye uptake via vesicular endocytosis, wash off the dye, then observe the rate of destaining of the synapses following electrical stimulation. This rate is directly related to the number of vesicle fusions during the final stimulation period. There is just one problem, Zhu and Stevens report that the presence of the dye reduces the release probability of the synapse. They observed this by taking the FM dye measurements in neurons that expressed synaptophysin-pHluorin. The fluoresence increase from the pHluorins was reduced in a [dye] dependent manner. A 15uM concentration of dye (not atypical for published experiments) reduced the pHluorin signal by 40%. The dye had no effect on the calcium levels in the presynaptic terminals, indicating it was potentially due to an increased energetic cost of forming a fusion pore. Chuck then weaves together some basic principles with this data to make an estimate of the fusion pore size. While this paper may seem to cover a minor technical point, FM dyes have been used to make numerous inferences about presynaptic release properties, modes of vesicle recycling, the locus of LTP expression, and other basics of synaptic physiology. The thing that’s bugging me is if this effect is as prominent as advertised, how did people not notice the change in release probability with electrophysiological techniques? Memories are thought to be encoded by the patterns of synaptic connections in the brain. Learning can either delete or change the strength of existing synapses, or add new synapses. Following a learning process, how can we tell which synapses were added to encode this new memory? One strategy is to make a timelapse movie of the synapses. In mice, this can be accomplished by installing a cortical window on the skull, and imaging the changes in structure of GFP labelled neurons. However, this is technically demanding, only works with sparsely labeled neurons, and accesses only a small subset of the neurons which may be involved in the learning process. 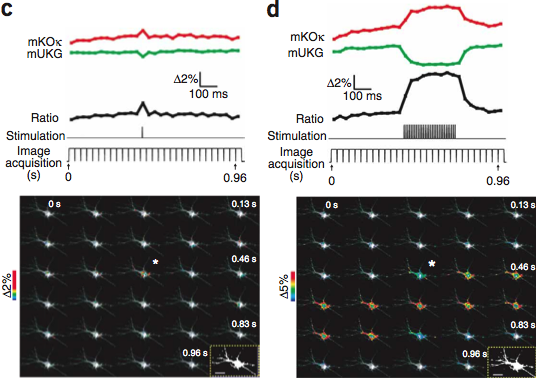 Ideally, one could have a tag which can discriminate between synapses existing before learning takes place, and new ones generated after learning has occurred. Whole brain regions could then be examined at a single timepoint to see where new synapses were added. In a large step towards that goal, Michael Lin et. al, from the lab of Roger Tsien, report TimeSTAMP, a genetic label for newly synthesized protein. 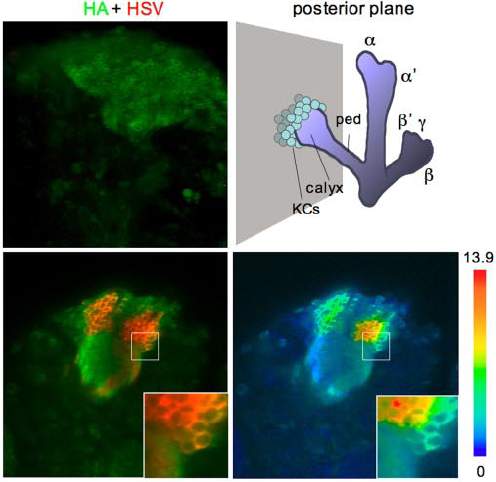 The authors engineered the NS3 protease from the hepatitis C virus (HCV) to cleave itself at just the right pace. 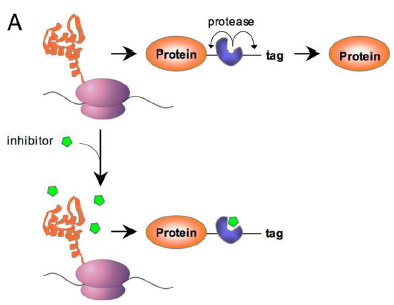 They then fuse tags (fluorescent proteins or epitopes) before and after the cleavage site. This fusion is then tagged to the end of a protein of interest. Shortly after synthesis, the protein cleaves off the C-terminal tag, but the N-terminal is left on. This cleavage is inhibitable by a variety of small molecule blockers. In the presence of the blocker, the C-terminal tag stays on. By controlling when drug is applied, they can selectively label a set of proteins of a particular age with the tags. The choice of NS3 protease was very clever, as it is a favorite drug target of biotech and pharma companies. Many inhibitors of this protein have been synthesized, exhaustively characterized in vitro and in clinical trials. This work is a great example of the standard research flow going in reverse; a basic-science project from an academic lab is actually benefitting from pharma company research. Stability, bioavailablity and toxicity have already been worked out. One of the biggest impediments is actually getting ahold of these compounds. Companies with their survival hanging on the clinical success of a single small molecule inhibitor are understandably reluctant to hand out stocks for academic research. Note the roller coaster stock price of Vertex following results of its NS3 protease inhibitor (VX-950) trials. 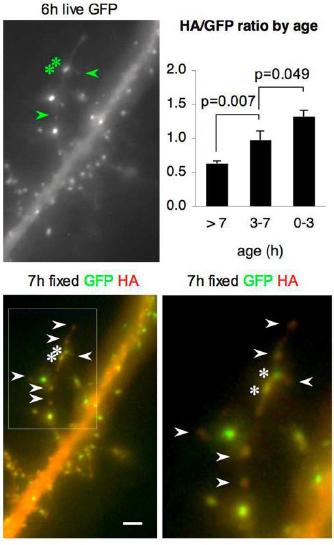 The authors use PSD-95 tagged to TimeSTAMP as a proxy marker of synaptic age. In neuronal culture, they show that newly synthesized synapses have a C-tag / N-tag ratio of about twice as large as old synapses. They extend the technique to whole fruit fly brains, showing a very heterogeneous distribution of CaMKII synthesis across Kenyon cells in different areas of the mushroom body. So far TimeSTAMP has not been shown to work in mice. Mice were not included in the paper due to the long generation time for transgenics. Given the good signal to noise and the large number of possible inhibitor molecules, I think this technique could be quite powerful in mammalian systems. It’s big advantage would be to label large populations of neurons or synapses in diverse brain regions, including those inaccessible to two-photon microscopy. TimeSTAMP’s success in labeling new synapses in the intact brain will be dependent on finding a protein to tag at the synapse with low turnover over the course of a learning experiment. 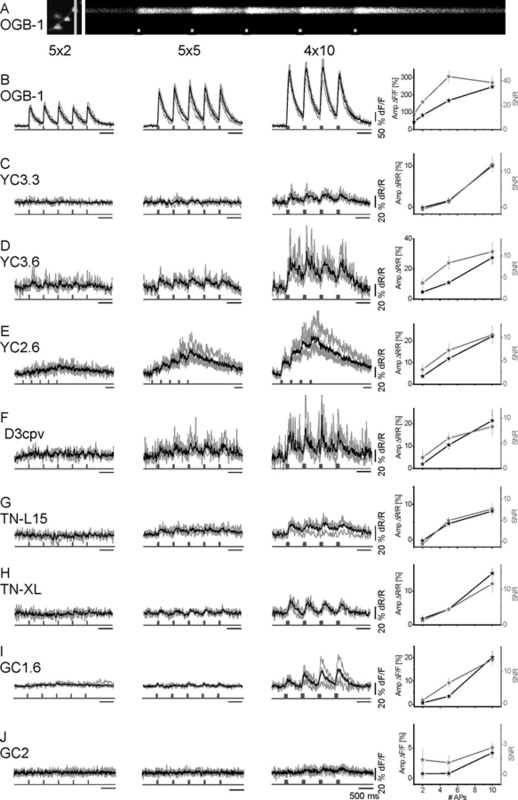 Though PSD-95 appears to be a reasonable marker in culture, others have shown a higher rate of turnover in vivo, making in unsuitable for a synaptic marker.